The Kim Sing Theatre was artfully reimagined in the early 2000's for private use and re-opened to the public in 2017 for the first time in 17 years. Kim Sing Theatre offers a unique space, carefully tended to and treasured by its' proprietors. Since it's rebirth, the space has been celebrated for being one of LA's most interesting venues and respected for its achievement in architecture and design. The former vaudeville house and movie theater was built in 1926 and completely re-imagined. Retaining original details such as bow truss ceilings and the neon theater sign, the site has been modernized into a striking and flexible live/work space with a large kitchen, serving station, and AV room. The center of the old theater has been turned into a soaring outdoor courtyard and features a large, open space. The 3,500 square foot, 2-story residential loft features 3 bedrooms and 3.5 baths, with soaring bow truss ceilings. The fully self-contained end suite has a separate entrance and includes a loft office and a midnight kitchen. 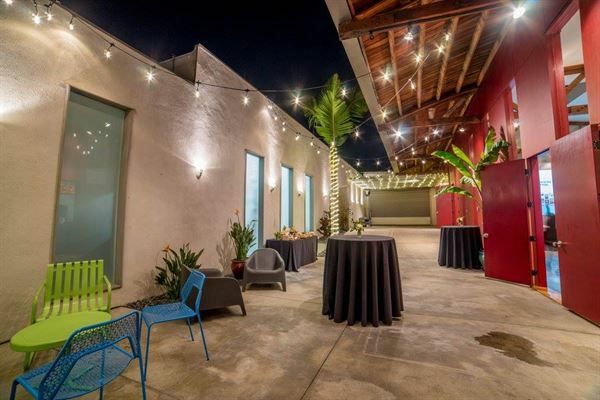 The space also boasts a large private courtyard oasis.